Fleet came from behind to record their first ever win at The MBi Shay with Corey Whitely’s debut goal and Luke Coulson’s second in as many games handing the visitors all three points in West Yorkshire. 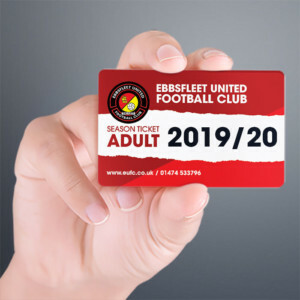 Just as a win over FC Halifax at the Kuflink Stadium was Fleet’s first back-to-back success of the season, so this was the first such combination of 2018. New boy Whitely had to settle for a place on the bench and instead Daryl McMahon’s changes saw Coulson back in the starting lineup, alongside Andy Drury, and that meant Jack Powell and Jack Connors were out. Fleet set up with Lawrie Wilson returning to a right-back position as part of a back four and he was soon into action having to marshal the dangerous Matty Kosylo who prowled the wing with intent, looking to supply rangy striker Tom Denton with a steady supply of crosses. But Wilson wasn’t the only one with a game on his hands as Denton dealt out his usual treatment to centre-backs and both Dave Winfield and Kenny Clark grappled with the big former North Ferriby striker on numerous occasions. 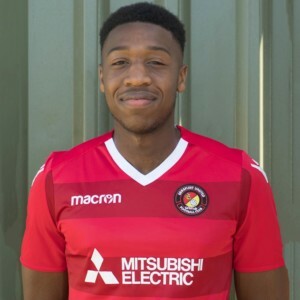 At the other end, Danny Kedwell slipped a neat exchange pass through to Myles Weston but that was too long for Fleet’s wide man to gather. Kosylo continued to create plenty of space for the home side and on six minutes he raced away down the wing and cut inside for Josh MacDonald. Clark got in the way of that one and Denton’s effort from the rebound was off target. Kosylo then had a shout for a penalty as he got away from Wilson and fell in the box after a challenge but the referee waved away his protests. Clark continued to get his head and body in the way of plenty from Halifax’s flanks, with the home side forcing a number of corners as they worked the ball well along the final third areas. On 16 minutes, Nathan Ashmore was the Fleet hero as he got a hand to Denton’s high header from a corner and the ball scraped over the bar. Moments later, another corner from Jake Hibbs was met once more by Denton with force and Ashmore did ever so well to claw that one away, too. 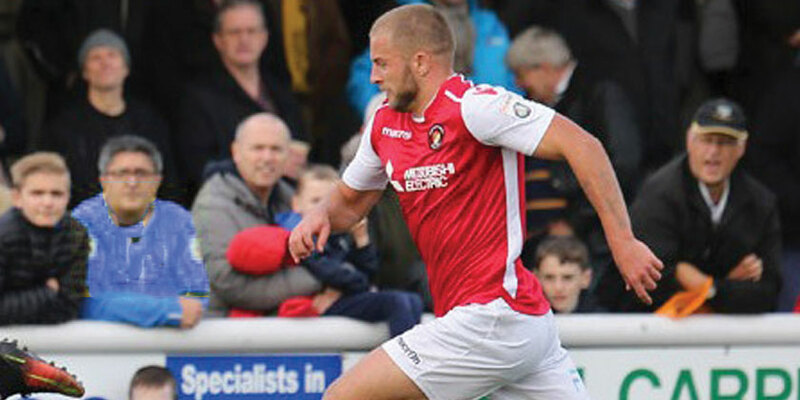 After that scare, Fleet managed to push the home side a little further up the pitch and the immediate threat lifted. Wilson was shown a yellow card for a foul on Connor Oliver and Denton, getting increasingly antagonistic towards the Fleet defenders, received similar punishment following a tussle with Winfield. Fleet were restricted to at best half chances. Coulson had a couple of runs, the most promising halted by Hibbs, while he supplied Weston for a curling effort that goalkeeper Sam Johnson had to push from the far corner. As the threat from Halifax seemed to subside, the blue shirts got their noses in front courtesy of the penalty spot. Again it was Kosylo who supplied the finesse from a long kick upfield, cutting in from his wide position into the box and gaining a head of steam before being checked – illegally said the referee – by Clark’s outstretched leg. Kosylo dusted himself down and despatched a confident penalty past Ashmore. Fleet had small claims for a penalty of their own with the next action of the game, Magri going to ground after a challenge from MacDonald, though the Halifax man came off worse and had to be replaced by Shaun Tuton two minutes before the break. The sides then exchanged a couple of wayward shots in four minutes of added time before the half-time whistle, Halifax halfway towards their first league win of 2018. It was little surprise to see Whitely introduced from the off in the second-half though it was Kosylo who was looking to make the headlines once more as Winfield needed to be alert to clear from him while Hibbs sent an effort wide. The busy Hibbs was very involved and Ashmore had to be off his line fast to intercept a through ball from him while the Fleet defence continued to work hard as Halifax pressed. 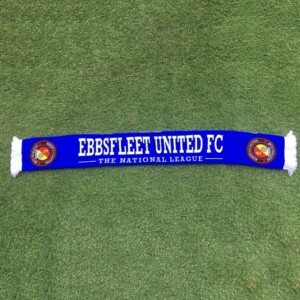 But Fleet lifted the pressure with two goals in five minutes. The equaliser arrived on 53 minutes when Kedwell fought to turn inside the box in that way he seems to relish and his ball came back out to Coulson who found Jack Payne with a deft pass. Johnson got a fine block in but the ball only travelled as far as Whitely who was quickest to react and force the ball over the line in a goalmouth scramble. And then it was 2-1. A foul on Kedwell saw Magri float a free-kick towards skipper Winfield lurking in space by the far post. He nodded it back inside and Coulson was there to send a rare header past Johnson to the delight of the 122 away fans. Halifax’s frustrations boiled over when Tuton left his leg in on Rance and received a yellow card for his troubles, Rance later leaving the field to be replaced by Powell. Fleet’s defending was assured but Halifax gradually racked up the pressure as time ticked away and forced numerous corners that the visiting back four did ever so well to contain. Fleet threatened on the counterattack, however, and Whitely was a real danger there, getting on the end of Coulson’s pacy runs out of midfield and passes forward. On 73 minutes, Clark might have done better from a Powell corner than plant it wide of the target. Whitely was twice more denied by some excellent tackling while much of Halifax’s potency foundered as Winfield and Clark stood firm, ably supported by substitute Chris Bush and Magri. The last five minutes, or effectively 10 with time added on, saw Halifax pile forward and supply high balls into the box for Denton as Fleet’s bodies were continually flung in their way. An unseemly flaring of tempers three minutes from the end saw Winfield and Ashmore tangle with Ben Tomlinson as players from both sides piled in, the latter two getting a yellow card apiece for their troubles. 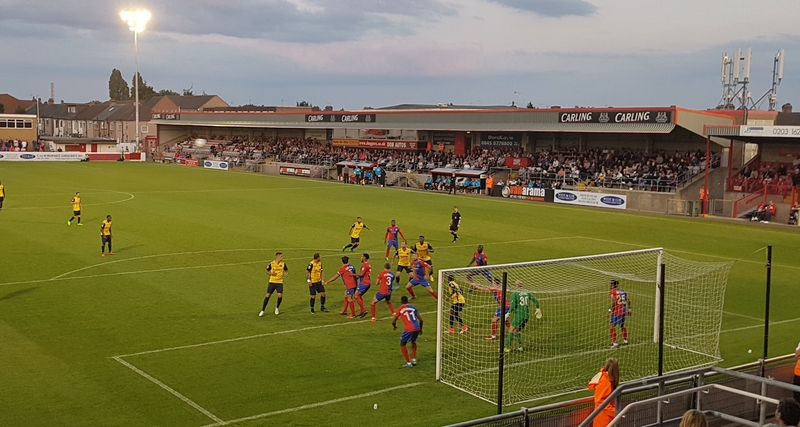 Fleet then withstood another aerial bombardment, with Denton, Oliver, Tuton and Matty Brown all seeing efforts either saved, blocked or fly off target, with both Coulson and Drury on hand to clear out of the six-yard box. 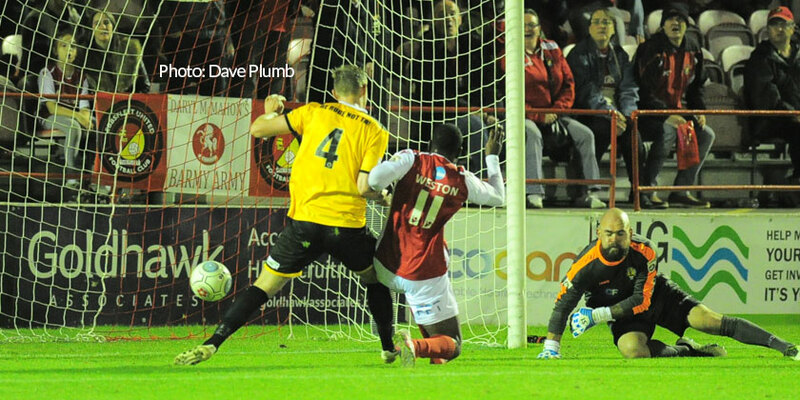 Fleet could have settled it at the death, however, when Whitely was put through and he rounded Johnson only to be fouled right on the edge of the box. There was no need, however, as Halifax could find no way past the red shirts and a valuable three points was the Fleet’s.